This two level 3 bedroom, 2.5 bath unit is located on the 4.5 mm of the main channel. 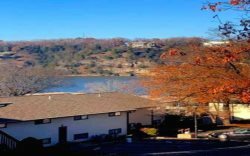 This unit has not only one but two lake view bedrooms along with a deck the full length of the condo. The living area is very spacious with a fireplace, ½ bath and separate dining area that has access to the deck as well. The upper level has 3 bedrooms and 2 bathrooms. The master bedroom has a king bed with a lake view and a full bathroom. The second bedroom has a queen sharing a guest bath with the third bedroom which has a bunk bed with a full on bottom and a twin on top also with a lake view. This unit does have cable. Has propane grill.